Members and supporters of the AFP Cavaliers celebrate the championship at the Smart Araneta Coliseum. 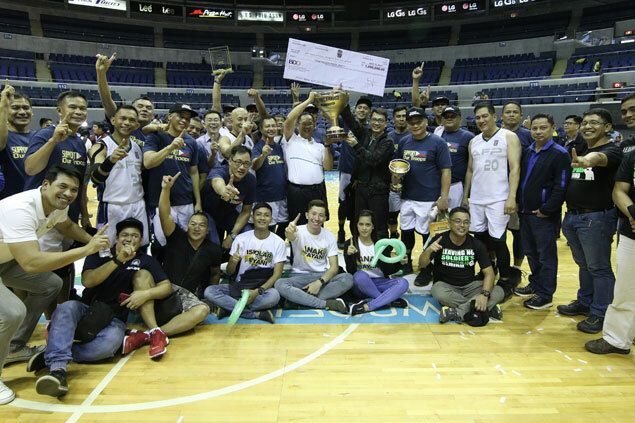 ARMED Forces of the Philippines (AFP) crowned itself as the first UNTV Cup Executive Face-Off champion by beating Philippine National Police (PNP), 75-71, in overtime before a huge crowd at the Smart-Araneta Coliseum. In claiming the bragging rights as the country’s toughest “men in uniform,” the AFP Cavaliers rode on the heroics of Army Col. William Gonzales and Dexter Macasaet, Gen. Gener del Rosario and Jonathan Abutin to frustrate the Gen. Ronald dela Rosa-led PNP Responders in a one-game face-off. The win was doubly sweet for the Cavaliers as they rallied from a huge 17-point (32-15) deficit early in the second quarter to claim the P1 million top prize in the event designed by UNTV president and CEO Daniel Razon for the country’s public servants. AFP Deputy Chief of Staff Vice Admiral Narciso A. Vingson Jr. said their prize will go to the AFP’s Educational Benefit System Office which grants scholarship to orphans and children of soldiers killed and wounded in action. The Respondeers, on the other hand, will donate their P500,000 runner-up prize to the families of policemen killed and wounded in action in Marawi City. The day’s other highlight was the awarding of P1 million financial grant to the Samahan Ng Mga Dating Professional na Basketbolita ng Pilipinas Foundation. “Nagpapasalamat po tayo sa palagiang pagsuporta ng ating mga kasama sa Church of God International, ang palaging pagsuporta ni Brother Eli Soriano sa atin pong mga ginagawa at sa lahat ng mga tumatangkilik at tumangkilik at patuloy na tumatangkilik sa ating ginagawang liga ng mga public servants, ang UNTV Cup,” said Razon, who was assisted by BMPI-UNTV vice president for administration Gerry Panghulan. Meantime, the selection of former PBA stars, led by Kenneth Duremdes, Allan Caidic, Jojo Lastimosa, Jerry Codinera and Vince Hizon, trounced the UNTC Cup selection, 117-85. AFP 75 – W. Gonzales 16, D. Macasaet 16, E. Abutin 14, G. Del Rosario 7, J. Paulo 7, C. Catubigan 6, M. Feliciano 6, K. Grajo 3, A. Agpalo 0, N. Clement 0, A. Devinagracia 0, O. Vesliño 0, L. Caranto 0, V. Bayani 0. PNP 71 – A. Padua 24, P. Limbauan 15, I. Dalogdog 9, D. Vitug 7, C. Empiso 4, J. Chua 4, P. Phillipps 3, A. Sintin 3, I. Dickson 2, R. Aspera 0, J. Aguillon 0, N. Quinsay 0, J. Ramos 0. Quarters: 14-26, 30-36, 45-46, 64-64, 75-71 (OT).